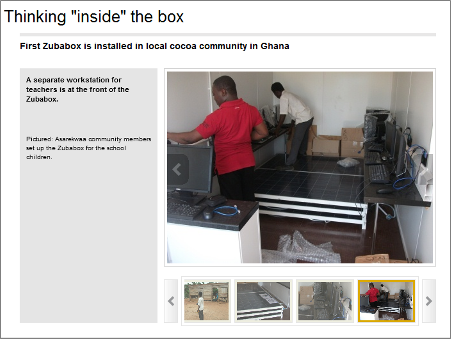 View the Zubabox slideshow to see the Zubabox journey from Tema, Ghana, to the Asarekwaa community. 25th March 2014 - In the rural and fairly isolated cocoa growing communities of Ghana, electricity is limited and the cost of internet access highly inflated compared to incomes. This digital divide limits the opportunities for rural communities to acquire crucial information and communications technology (ICT) skills and access the host of information available in the digital world. So what do you do when you have an empty container, a number of used computers and a solar panel? You think ‘inside the box’ and call on Computer Aid International to send a Zubabox – a solar powered, all-in-one, internet-enabled IT classroom, equipped with 11 reconditioned computers. The Zubabox is made from a converted shipping container, shipped ready-to-use and operates without the need for electricity connections and internet wiring. This ICT solution was designed by Computer Aid International to support rural communities in Africa. The school, which has over 390 children and only 11 teachers, is located approximately 150km from the port of Tema. Initially, the Zubabox will be used by the school but there are already plans to open this up to the broader cocoa community particularly farmers. “The ZubaBox concept was designed to help rural communities access the internet and IT equipment which can have a huge impact on poverty reduction. Learning IT skills at school means children will be able to gain better paid employment in the future. As we have seen in other locations, extending the box to local farmers can help them access local weather forecasts thereby allowing them to adjust the planting and harvesting times of their crops which in turn leads to increased agricultural productivity and food security,” says Keith Sonnet, Executive Chair for Computer Aid International. Following the ceremony, the school and the community will start to learn to use and care for the Zubabox. Cargill provides food, agriculture, financial and industrial products and services to the world. Together with farmers, customers, governments and communities, we help people thrive by applying our insights and nearly 150 years of experience. We have 142,000 employees in 67 countries that are committed to feeding the world in a responsible way, reducing environmental impact and improving the communities where we live and work. For more information, visit Cargill.com. Cargill has been sourcing cocoa from Ghana for over 40 years and constructed a state of the art cocoa processing facility which has been operational since 2008. Cargill already works with over 50 Ghanaian cocoa farmers in the Asarekwaa region as part of our Cargill Cocoa Promise focusing on providing farmer training, community support and farm development. Under the Cargill Cocoa Promise, Cargill invests and provides financing, training and support to not only secure a sustainable cocoa supply chain but also helps to address broader issues facing cocoa producing communities.